Welcome to Down On The Mile High Street, where we admire old vehicles on the streets of the City That Rust Sorta Ignored: Denver, Colorado. I'm not even going to try to guess the model year on this thing! 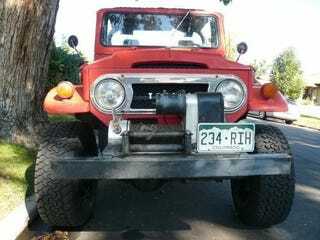 Being a city boy, I'm no expert on serious off-road machinery, and damn near all Land Cruisers of this era have had the hell modified out of them anyway. I don't see side marker lights, which may indicate that it's a pre-1968 model, but I'll leave the speculation to the readership. All I'm going to say is that I approve of this fine machine and the fact that it's still on the street after at least several decades.